Japanese Americans across the United States last week folded thousands of origami cranes to be strung together and hung across a fence outside a detention center in Texas on Saturday in protest at the detainment of immigrant families. "It is important to show solidarity with detained migrant children, women and families because of (Japanese Americans') history with unlawful detention and family separation during WWII," Stanley Shikuma, a third-generation Japanese American whose family was incarcerated during the war, told Kyodo News on Monday. "The echoes of the past -- detention without trial, imprisonment based on race, mass incarceration of children and families -- bring back many haunting memories for our community," Shikuma said. The South Texas Family Residential Center in Dilley, Texas, which opened during the administration of President Barack Obama and is the country's largest family immigration detention center, houses nearly 2,400 women and children, most of whom are Central American asylum seekers, while their immigration cases proceed or before they are deported. In Seattle on March 20, the Japanese American Citizens League joined organizations in cities such as Los Angeles, Philadelphia and New York in hosting a Tsuru (crane) for Solidarity origami-folding event. 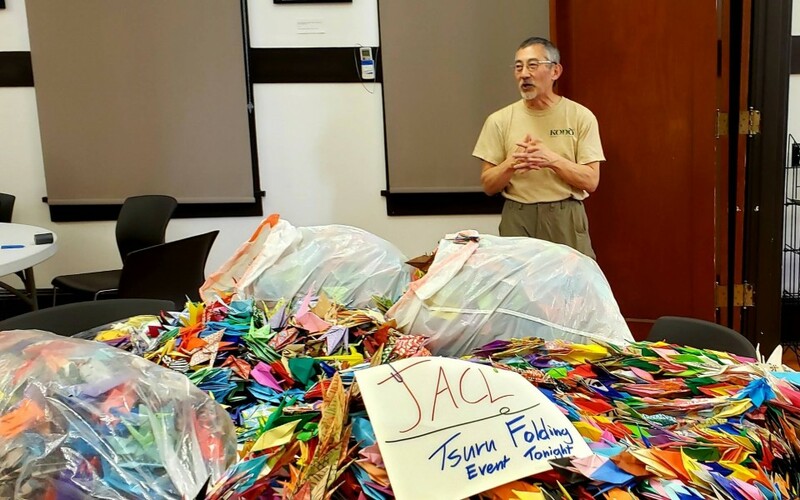 Local volunteers, non-profit organizations and families in Seattle made more than 10,000 cranes to send to Grassroots Leadership, one of the organizers of Saturday's protest at the detention center, said Bill Tashima, a Seattle JACL board member. Shikuma, also a Seattle JACL board member who co-organized the event, said, "A number of people said they were there because we should not be locking up children." "They were hoping the children and families would be able to see the cranes on the fence and know that someone outside was thinking of them, that maybe the cranes would be a signal of hope." Former internees and their descendants will be among those protesting outside the detention facility after making a pilgrimage Saturday morning to the site of the former Crystal City Family Internment Camp, located some 65 kilometers from Dilley, where many people of Japanese descent were confined during WWII. "We feel that as Japanese Americans we need to be the ally that we needed during WWII," Kimiko Marr, coordinator for the Crystal City Pilgrimage Committee said. "We want to make sure that mass incarceration of any group never happens again in this country." The pilgrimage participants will tour the site's eight historical markers and honor those who were incarcerated with Buddhist and Christian blessings. According to the Texas Historical Commission, the Crystal City Family Internment Camp held as many as 3,374 "enemy aliens" during the war who were of Japanese -- comprising two-thirds of internees -- German and Latin American descent. "In 1942, very few neighbors and almost no organizations were willing to stand by us and stand up for our civil and human rights," said Shikuma. "We know how that feels and where it can lead, so we have a moral obligation to step forward and give the support that we wished we had received back in WWII." Marr said the cranes may make an appearance in future events after Saturday's demonstration, including a larger Crystal City pilgrimage planned for November.